Jez, you did a great review of the screenused AT-AT driver helmet. You pointed out things I never noticed before. I honestly don't study the stormtrooper-related stuff to any level of depth, so your video coverage was most educational! I'll second Mac's compliment on your AT-AT driver helmet review Jez - the video was great. Amazing what red tape can do LOL. I consider starwarshelmets.com an invaluable research and reference tool and just wanted to add thanks much for the great work and support in the SW fan community. And you are still insulting me severely Mac. Guess what, I am predominately a Boba Fett collector. Gino isnt my largest source for Fett info people like Art Andrews, Singleseat, Lee Malone etc are. And I even made some discoveries they hadnt. So before you go running your mouth about how I should be "trained better" by Gino (to be his little puppet perhaps?) and dont see what everyone else sees just remember I am my own man. I am getting really pissed with the same old routine. Here on the Den we're generally pretty friendly until we're insulted, pushed, bullied, or maligned. The way Gino describes his props has caused problems with you fellows before. Remember when there was a huge debate over how he described the origins of his Vader hard parts? You all called him a liar then and it was just as weak as this whole argument. That is exactly what I was referencing when I said we can debate how he describes his props and the threat of you pointing that out was what made me say I wish that could be left out of this thread. You dont seem to be able to understand what Gino is saying his Vader helmets are. So that was a stormtrooper molds thread. You brought up Vader and basically maligned everyone on it by saying our collective analysis and prop observations are "slander" and "false 'facts'". You said you wanted to be apart from the Gino crowd. Well, the Gino crowd typically highlights what they consider poor past performance, but when confronted with discussing prop observations they are ill equipped and rarely follow-through and participate. Since you brought up the topic of GINO's ANH Vader to blast SithLord by highlighting poor past performance, you were invited to that thread to dispute the information, and so far all you've done is backpedal and say you're not interested in GINO's ANH Vader. So if you're severely insulted by my pointing this out to you, then you brought it on yourself because you didn't chose a diplomatic approach. But if you attack people in the fashion you've done without backing up your statements, be prepared to dislike the reactions of people who dislike your manner. Mac you interpret everything I say incorrectly. This is why I shouldnt even bother continuing to mess up this thread with responding to you. When did I bully you? I just disagreed with you in the other thread. You are the one absolutely bullying me be continuing to suggest that I am ignorant, biased, and a Gino lackey. Move past that and discuss issues as they come. I am so doggone tired of talking about Gino you have no idea. Referencing the Vader helmet thread was an attempt to demonstrate how misinterpretation of something can lead to a whole big mess. 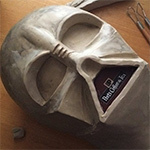 You still dont understand the terminology of his Vader helmets and think he is claiming his ANH Vader helmet is right from the actual mold that made the first ANH Vader helmet. This has never been the case. And Thomas didnt need to invite me to read the thread. Believe me I did. So brushing it off is my way of saying I am not interested in starting that whole debate again. Maybe its too late now.. So yes, your observations were based on incorrect "facts" based on your (collective) incorrect interpretation of them. And I consider all the wonderful comparisons therein to not prove a darn thing other than Gino's helmets look similar to other Vader helmets. Why shouldnt they? I have been Very diplomatic Mac. You have no idea how hard it is for me but truly, you cannot point out anywhere where I set out to insult anyone. Is it insulting to mearly say I dont like someone or I disagree with their observations? I have not been insulted when that happens to me. Where I do get insulted is when somebody tells me something about myself, another incorrect "fact" brought on by incorrect interpretations and expects me to abide by that "fact". I will not have it. My apologies to TMG. Back to the props. Mac if you have anything else please PM me as I have offered before. We're going in circles, so I have nothing more to say. Hey, I've been gone for about a year or so and I'd like to catch up a little. Anything else come out about this wonderful suit? Any new pics or any insights? Wow, I've been absent from this board for far too long. Great finds fellas. After reviewing all the photos in this thread, it sure does appear to be the same as the ESB Poster helmet. What a cool cool discovery. The good thing about being a dentist is seeing how things will look when turned in 3D. The pic supplied by DCarty, is a wonderful bit of evidence for this being the same helmet. You can't see one of the two cracks clearly on that upper tube, but the other two are quite clear and they line up nicely in my opinion. Really loving this thread. Thanks for sharing this stuff guys. I have gotten bogged down over at the RPF for too long. The RPF or as I like to call it, the Vagino/Art Variety show.........has become dead and boring as of late. The one month where gina was gone via temporary banning, was like a vacation in the caribbean for me. But now he's back and unleashed. Again, just glad to be here. Jez I have to agree on that ATAT helmet expose........it gave me the nerve to finally do my own helmet. If it hadn't been for your excellent work, my helmet would have been white like every other fan helmet out there. Thanks mate! Regarding the idea that some of this costume might be screen used ANH parts, I really don't think so. However, there is something 'authentic' feeling about this suit, and frankly it's one of my favorite suits in private collection. If I didn't have the one I'm putting together I would want this one! From what I've seen here, I believe that this may have been made from some original patterns, or the same B and N people who made the original. As a sidenote, according to KE, there were no B and N tags (or any other tags for that matter) inside any of the garments.